PMA Tool offers lightweight yet sturdy cleaning cradles that are handy, affordable, and easy to transport. 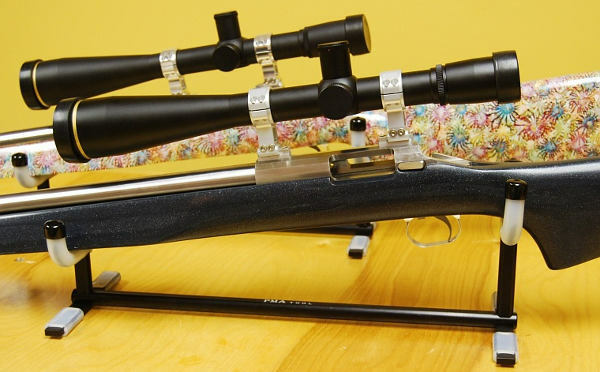 PMA’s single-gun cradle, priced at $75.95, is ideal for benchrest rigs. It measures about 17″ in length and weighs about one pound. 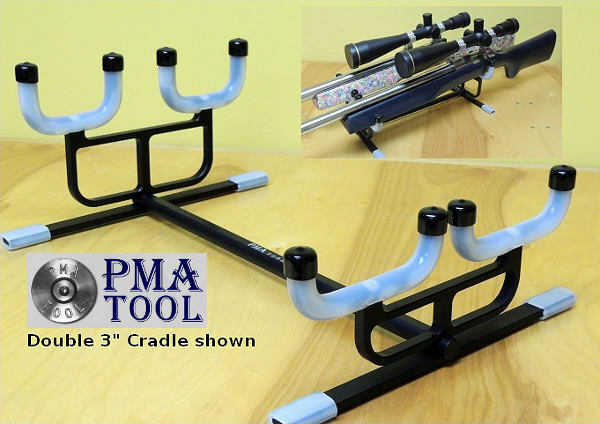 PMA now also offers a two-gun cradle for $119.95. Both single and double cradles secure your rifle(s) in a muzzle-down position that allows easy cleaning and prevents solvents from running back into the action. The front “saddle” and all contact surfaces are covered by thick silicone rubber padding which grips the rifle securely yet protects the stock and components from scratches. These cradles are currently available either with a 3″-wide front saddle for Benchrest and F-Open style stocks, or a 2.5″-wide front saddle for rifles with narrower narrower, flat fore-ends such as those found on Hunter Class and modern varmint stocks. PMA’s double rifle cleaning cradle was was designed from the ground up to work perfectly for two rifles side-by-side. Using the same tie bar and protective saddles found on the single cradel, PMA widened the base and created new uprights to support the saddles, making the cradle as narrow and light as possible, while retaining all the protective and non-slip features from our single unit. This unit is available in double 3″ front saddles, double 2.5″ front saddles or combination 3″ / 2.5″ front saddle configurations to accommodate multiple classes of rifles for centerfire and rimfire benchrest competition. Share the post "Lightweight Cleaning Cradles from PMA Tool"